After our first trip to this extraordinary country, we promised ourselves to return as soon as possible. This dream was brought to fruition a bit sooner than anticipated when we received an invitation to attend the wedding of our dear friends, Isabel and Paulo. Our Air France flight from Paris to Porto, Portugal, was very comfortable with excellent food and service. Arriving in Porto at 20:30, we taxied to the Hotel Infante de Sagres, located in the heart of the city at Praca D. Filipa de Lencastre 62. This establishment is like a pair of old jeans that you can't wait to slip into. It's just not possible to feel more comfortable. The hotel manages to be both majestic and homey. The 18th century Italian inlaid table with ivory and mother-of-pearl that sits on a beautiful Tabriz rug in the wood-beamed main lobby reflects the grandeur. The happy face and the warm welcome from Francisco Torres at the front desk made us feel as though we'd never been away. His offer of a glass of Port wine, while we registered, really hit the spot. Our accommodations were fabulous - a large bedroom with a king size bed and a comfortable sitting room with a desk and two completely equipped bathrooms. The furnishings were exquisite as they are throughout the hotel. The included sumptuous buffet breakfast is served in the splendid Dona Filipa dining room off the main lobby. Linda had been looking forward to the outstanding baked apples that were a regular buffet item last time. Nowhere to be found! We asked and in a few moments two still warm from the oven apples were before us. The day was off to a sweet start. We spent the morning enjoying the pulse of this vibrant city, the second largest in the country. The shopping streets Rua de Santa Catarina, Rua de Sa da Bandeira and Rua de Passos Manuel were alive with activity. We strolled slowly, exchanging Bom Dias with everyone, as is customary, checking out the shops, enjoyed the heavenly scent of fresh breads and pastries and most important the smell of chicken grilling from numerous barbecue places we inspected as we walked. Once you've found the best, forget the rest. We returned to Churrasqueira Moura, Rue do Almada 219-223 with the intention of having the frango (chicken) and fries. When we arrived at 12:30 the place was full, except for one table at the rear. As we walked through, the sight of the daily special of grilled sardines made the frango a vague memory. These large, fresh from the water, beauties were perfectly grilled crisp outside with fresh, tender flesh. Potatoes are a favorite staple in Portugal and have a very special flavor and freshness no matter how they are prepared. The herb boiled version, which accompanied the sardines, was delicious as were the grilled yellow and red peppers. The traditional mixed salad of lettuce, tomato and onion dressed with the perfect blend of herb scented oil and vinegar. Our destination after lunch was The House of Sandeman in Vila Nova de Gaia, home of the Port Wine industry, and a visit with our friend Ligia Marques, the Public Relations Manager for Sandeman. The Gaia is south of the city across the Douro River by way of Ponte D. Luis, easily walkable from anywhere in the city center. 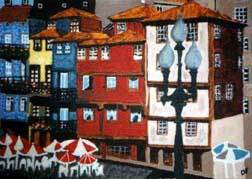 We passed familiar sights and numerous buildings decorated with azulejos, the blue and white tiles painted with scenes of cultural, historical and religious significance, reminding us of the proud character of this city and of Portugal. The road to Gaia leads through the Ribeira, the town's oldest quarter. Clinging to the steep hillside along the river, it's a maze of skinny, stone streets, stairs and colorful homes. Many of the best restaurants are located here. When we were here in 1997, much to Ligia's dismay, we did not have time to devote to the Douro region. Not wanting to repeat our mistake, we had planned for a three day visit to the Douro on our way to Coimbra for the wedding. Today Ligia would review our itinerary and offer her advice. She concluded that we hadn't allowed enough time for the Douro and that she would pick us up in Coimbra the morning after the wedding and take us on a two-day tour to perfect our experience. Francisco had recommended Chez Lapin, Praca da Ribeira, and had made reservations for us. Located in one of the alcoves just behind the waterfront, this family-run restaurant serves rapturous renditions of typical regional cuisine. There is outdoor seating in the alcove which, like the ground floor, was completely filled when we arrived. We were shown to our table in one of the two upstairs dining rooms. As we walked through the eclectic stone, tile, stucco and timber interior, we witnessed the diners obviously enjoying their glorious looking and smelling offerings and we already knew we had lucked out big time. Francisco had hit the nail on the head with this place! Our waiter patiently reviewed the menu with us, explaining the preparation of each item of interest to us. Our shrimp appetizer consisted of a dozen large, succulent shrimps in their shells, served in the pot in which they were cooked in herb and garlic infused olive oil. Fish and meats cooked in clay or metal pots in the oven with vegetables are traditional specialties. At Chez Lapin, the delicate swordfish was baked with olive oil, herbs, garlic, potatoes and small, sweet onions and the tender, meaty rabbit was done just as deftly with the addition of white wine. Almeida, the happy and gregarious owner, stopped by to introduce himself and to check that we were enjoying our dinner. He moved from table to table, checking that his guests were satisfied - adding his special personal touch to the gastronomic experience. The Douro River runs from Porto to the Spanish border. The valley of the Douro, her rock crusted, mountainous borders transformed into walled, fertile terraces, is a gigantic vineyard. The Douro name is synonymous with wine. Rolling up, down and through the mountains in late spring, one is awestruck by the patchwork hues of green. Mind boggling to us was is labor that went into carving these terraces out of the rock, hauling the soil, planting, fertilizing and the difficulty of the ongoing maintenance and harvesting on these steep slopes. The grapes are cut from the vines by hand and hauled up and down the slopes in baskets strapped on backs. I strapped an empty basket onto my back and, absent the grapes, it was pretty darn heavy. These are hard working, sturdy people. Long ago, it was discovered that the combination of soil and climactic conditions in this valley were ideal for the cultivation of the grapes used to produce the Port wine. In the 18th century, the Marquis of Pombal rewarded their hard work with the title of Demarcated Region, the world's first. Today it is more than just Port; wonderful reds and whites are produced here and since our visit in 1997, we have been buying them here in Toronto and have seen their popularity increase. On this trip we would also discover the excellent sparkling wines and Favaios Muscatel. The conditions ideal for grape growing are also perfect for olives, almonds, cherries, figs, peaches, oranges and apples and these can be seen dotting the slopes along with vividly colored wild flowers. The ideal way to tour the Douro is slow and easy, by car. There are Douro River cruises of varying lengths from Porto but we opted for the train and bus alternative for the three days we had planned. We had decided to headquarter out of Lamego, located in the heart of the south Douro. We left Porto just before 11:00 and about three hours later we arrived in Peso da Regua, the hub of transportation for the area. The bus to Lamego was waiting for us and 30 minutes later we were at the Albergaria do Cerrado, located just beyond the city center, across from the bus station - really perfect for our needs. This is a spotlessly clean, family-run place where the owners live in an apartment at ground level with the guest rooms above. A small lounge is off to the left of the registration desk and a larger bar/lounge on the right is where we were invited in for coffee and delicious homemade cake. It was just lucky timing. They were expecting guests who soon began arriving and that was their way of not making us feel left out. Our room, like a basic size motel room, was nicely furnished and quite adequate, with a good size balcony. The included breakfast buffet consisted of standard offerings. The breakfast room is filled with lovely antiques that create a pleasant atmosphere. The most outstanding feature of this place is the attention to cleanliness; it seemed as though someone was always about wiping, scrubbing, washing or polishing. The owners are sweet people and most accommodating. It's an excellent three star value. 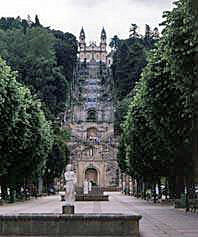 Lamego is the cultural capital of the Douro. The tree-lined wide esplanade through the center of town, a hub of social activity, leads to the monumental staircase at the top of which, perched over the city, is the Igreja e Escadorio de Nossa Sr. dos Remedios. The wooded area surrounding the terraced stairways is a playground of outdoor activities including sports and picnicking. When we finally reached the summit, we felt pretty good about the calories we had burned off. The Museum of Lamego is housed in the ancient Bishop's Palace, rebuilt between 1750-1786. The original collections of furniture, paintings, tapestries, sculpture and some priestly garments and jewelry are from the original Bishop's Palace. Other churches and convents in the country along with private citizens and local governments have contributed to the present collection. Truly outstanding are the panels from the cathedral of Lamego, the Vasco Fernandes painting and the 16th century Flemish tapestries. The creativity, time, patience and skill that went into creating these tapestries is extraordinary. The cloister and adjoining chapels are particularly impressive. Other notable evidence of the cultural significance of the city is the Nicolau Nasoni paintings on the cathedral dome and the baroque fountains and statues to be found all around. The narrow streets off the main esplanade led us up into the old town. It wasn't easy passing the tiny, neighborhood food shops, cafes and restaurants and not stopping for a few samples. It was still early and we had ground to cover. Working our way up, we were impressed by the way the old homes had been maintained. The streets were spotless and many of the doorways and steps were being scrubbed as we passed. Unfortunately, the fortress at the top was closed but we could appreciate the views of the surroundings. In contrast to this old town and the history we had just left below, we could see new high rise apartment buildings springing up above the area where our hotel was located. On our way down, we passed a tiny, tiny church from which four ladies were emerging. They eagerly told us that this was the original church of the town and the one lady who spoke English gave us a history lesson and was thrilled at this opportunity to practice the language. When we were near the cathedral, we had seen an interesting looking restaurant in its shadow, appropriately named Tras da Se (across from the cathedral), on Rua Virgilio Correia 12. Linda had to drive me out of the fabulous pastry shop next door. The ambiance is pure kitchen. The family Freitas - Abilio, Fatima and adorable 13 year old son, Jorge, who waited on us, made us feel right at home. We shared half orders of roasted cabrito (goat) and leito (pig), which were perfect. The excellent hand cut fries, white rice and mixed salad rounded out the meal along with the garlicky black olives and corn bread and the refreshing, chilled vinho verde. While we were waiting for a bus to take us from Lamego to Regua on our way to Vila Real a tour bus pulled into the station and discharged its male occupants who immediately began unpacking the contents of the large baskets they were carrying. Right in the middle of the open-air bus depot, they proceeded to enjoy an animated picnic with tons of food and wine. The aroma of meats, sausages, ham and cheese filled the air - torture! A Portuguese couple we had met suggested that these were probably some company employees enjoying a "boys only" short holiday. The countryside between Lamego and Regua is pure Douro - hills and valleys tiered with vineyards. It was cherry season and the roadsides were filled with stands piled high with the fresh crop. The bus we thought was scheduled from Regua to Vila Real did not appear and we discovered that was because it was Sunday and it wouldn't be going until much later in the day. We found a taxi driver who lived in Vila Real and was going home for the day and willing to give us a very good rate. Winding through the hills and mountains from one incredible vista to another took our mind off the speed at which we were flying around the hairpin turns. We asked the driver to suggest a churrasqueria for lunch and he dropped us off at Ze DOS Frangos, L. Pioledo 20. It was the Sunday family hour. The place was jumping and the frango was flying off the grills. Half a chicken along with grilled sardines, boiled potato and broccoli landed on our table. A perfect lunch in a perfect neighborhood environment. Vila Real is famous for its grand manor houses. The best known and open to the public is the Mateus Palace. This is an 18th century baroque masterpiece. The residence is surrounded by impressive gardens and as we walked through, we appreciated the design and care of the sculpted plantings. Further beyond the gardens are the vineyards from which the Mateus rose' wine is produced. We enjoyed gawking at the fine mansions and exploring the old pedestrian shopping streets that were today filled with locals enjoying the brilliant and warm weather. The best part of this visit started at the train station where we boarded the single red coach that runs on a narrow gauge line back to Regua. While the taxi ride up was special this train ride back, twisting and turning on the sides of the mountains from high up to way down low, was incredible. We were continuously surrounded by green mountains, vineyards, olive groves with sightings of sparkling waterways deep in the valleys. It is a must to take this train at least on way - preferable from Vila Real to Lamego - as the climb is reputed to be laborious in the other direction.